Lagos is a very big and sometimes chaotic city. If you have lost family here you wont always find them. But do try! It is always good to be very active when searching and try different things. But helping hand from a professional private detective could still be your best bet. Also, if you want me to post about your missing individual, please email it straight to me. Mary Onwenu is missing. Born in the UK in 1986, but moved to Lagos in 2012. Mother Angela is from Epe living in London. Any clues about where she could be please send to the owner of this website. Same thing goes if you know anything about a person named Funke Okon. He always had funny colored short braided hair. Sometimes there was red in it, sometimes yellow. He moved to Vienna, Austria in his late 20s. He should be around 40 years old now about 180 cm. Wears glasses. Sometimes we get ourselves into trouble or we just go through really hard times and because of that we avoid contact with our loved ones. To spare them having to go through it all with us. This is what happened to Mimi's brother Audu. She had long suspected that something was wrong. He wasn't himself. Her sister and Mimi tried to help but it just seemed getting worse and worse. They live in Ikorodu and about a month after her brother's last phone call she went to the place in Lagos where he had said he was living temporarily, but he wasn't there and the people who were there did not know him. 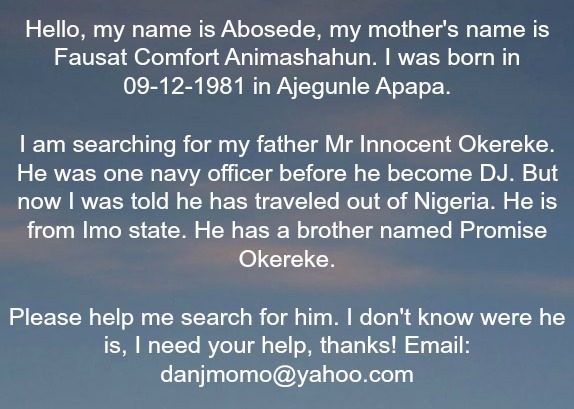 Her whole family and many friends helped with the search for Audu. Finally after lots of research, one of his cousins who is good with computers managed to log into his Skype account and found a chat session between him and someone that none of the family or his friends knew. From their conversation it seemed like it was a woman he had met online but never yet met in reality. In the chat session that was many months old Audu mentioned that he would not be on the internet for some time because he will be at the hospital getting treatment for depression. It's interesting how much we reveal online to people we have never met. Yet to our family and friends we are more careful of what we say. They called all hospitals and mental institutions in Lagos and guess what? They found him! He had already been at the hospital for three months. He was diagnosed with bi-polar depression but with the right treatment he will probably grow out of it. This is Mimi's message to you: if you ever feel like withdrawing from your family because you for example are ashamed of something, try not to do it. Once you have been honest enough to share your trouble or sickness with them they will do their best to help you. And if not, at least you tried your best. On this People Search in Lagos Nigeria page I also want to write about finding individuals in other countries on this large continent. One person asked me about finding someone in SA for example. Hello, my name is Ira. I am seeking for a guy, whose name is Kelsey Brandon Arpin. A South African, who now lives in Swaziland and works at Chrisilda Transport Co.
On the 8th of August I went to my relatives' summer house, the internet connection was very bad there, so I was just able leave a message on Facebook to warn him that the internet is bad. When I came back home I saw that he didn't pop in to FB, I sent him a lot of messages on email, Skype, Viber and WeChat. But I didn't get even a single answer. Hi Ira! I found the address you gave me. It's the address to the transport company he works at, not his home. It is the same with the phone number - it's a number to the company. Do you have his home number, mobile or personal email account? Maybe he has been fired and can't reply from his work email anymore? Things like that happen.. But strange that he is no replying to your FB massage. Make sure you check his Facebook page from time to time. Are there any updates or any activity? Could you ask his FB friends? I think they can help you even if he now lives in Swaziland. Hello Tonia! This is Ira. Thank you SO MUCH for you immediate answer. Kelsey contact me just yesterday. He was stuck in Mozambique, he went there on business. Everything is fine. Thank you so much for your searching! I wish you luck and a lot of inspiration in searching people. I also wish you a lot of happy stories about finding missing people. Please know that you have a friend in Kiev, this friend is me.